Spending the July 4th holiday in West Michigan makes it a real celebration, as the area has six firework displays! 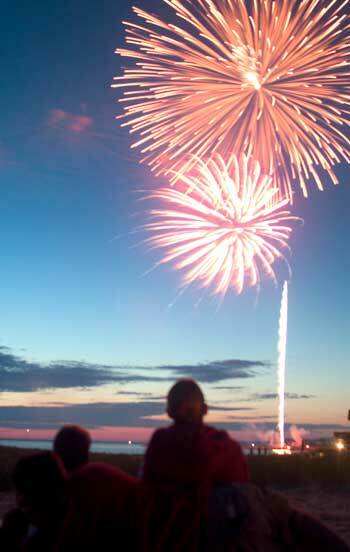 You can watch fireworks in Hart, Manistee, Hamlin Lake, Ludington, Pentwater, and the Silver Lake Sand Dunes. If you're vacationing here, arrive early so that you can find a good place to park. Be sure to check the weather forecast so that you don't get caught unprepared when the night temperatures settle in. Give yourself plenty of time to get an ice cream cone, and then just relax and watch the sunset. Perhaps you will find a great spot on the beach, or you might prefer to bring a lawn chair and enjoy watching people have fun around you while you wait for the fireworks to begin at dusk. There are a variety of activities over the 4th, including parades, art fairs, and more. Make the most of your holiday, right here in West Michigan. Get a jump on the firework festivities and enjoy the colorful display in downtown Hart. The full day of fun includes kids activities, live music, and food. The fireworks begin at dusk. The charming village of Pentwater is a great place to spend your summer holiday. The fun includes the Annual Pie Contest and Auction to raise money for scholarships. The fireworks are at dusk at the Charles Mears State Park. If you're a bit north of Ludington or staying at the Ludington State Park, find a comfy spot and view the colorful display over Upper Hamlin Lake. One of the best places for viewing the Hamlin Lake fireworks is from Wilson Hill Park. The Manistee Forest Festival features several days jam-packed with great food, music, and parade. Fireworks begin at dusk over Lake Michigan. Thousands flock to Ludington for the Freedom Festival. The Children's Pet Parade is held July 3rd, and the Grand Parade travels down Ludington Avenue in the early afternoon on the 4th. The fireworks on July 4 over Lake Michigan are truly spectacular and can be seen from numerous vantage points along the water. The Silver Lake area has their fireworks display at dusk over the sand dunes. While vacationing here, enjoy rides on the Silver Lake Sand Dunes, visit the Little Point Sable Lighthouse, or take a hike or bike ride on the Hart-Montague Bike Trail. Registration Open Now for the First Annual Spartan River Run Kayak Race! Enjoy a West Michigan Sunset! Ludington Activities & Things to Do -- Play on a beautiful beach, take a tour at Historic White Pine Village, or explore the barn quilt trail, murals or sculptures in the county--Ludington offers many fun things to do for the entire family! Have Fun in Manistee, Michigan -- Explore Manistee's historic downtown district and riverwalk, hike the Manistee National Forest, canoe on the Manistee River, and more. Hamlin Lake -- Just 4 miles north of Ludington, Hamlin Lake is a great destination for boating, fishing and climbing dunes! The Hamlin Lake shoreline is also part of the Ludington State Park. Silver Lake Sand Dunes -- Visiting the Silver Lake Sand Dunes makes for a terrific vacation because you can take your off-road vehicle for a spin on the scenic sand dunes overlooking Lake Michigan and Silver Lake. Things to Do in Pentwater, Michigan -- Nothing is quite like the quaint, artsy, harbortown village of Pentwater. Don't miss the popular Charles Mears State Park beach on Pentwater's Lake Michigan shoreline. Lots of Activities in Scottville, Michigan -- Explore the Riverside Park along the National Scenic Pere Marquette River. Canoeing or Fishing on the Pere Marquette River -- Many boat liveries offer canoe rentals. Also, check out West Michigan Guides and our locally produced WestMichigan.MichBiz.com for our largest lists of Things to Do in West Michigan.